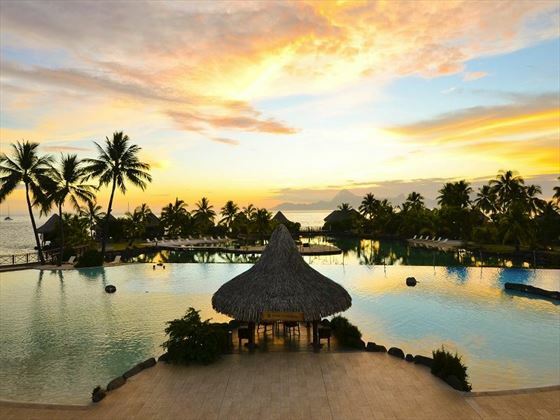 A popular retreat for those hoping to enjoy the tropical beauty of Tahiti’s main island, Intercontinental Tahiti Resort & Spa truly brings to life the Polynesian lifestyle. 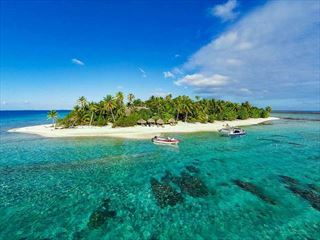 Overlooking a glistening lagoon and the sister island of Moorea, you’ll enjoy a colourful garden setting, as well as having access to two fabulous infinity pools – including one with sand at the bottom – great water sports, and a luxurious spa. 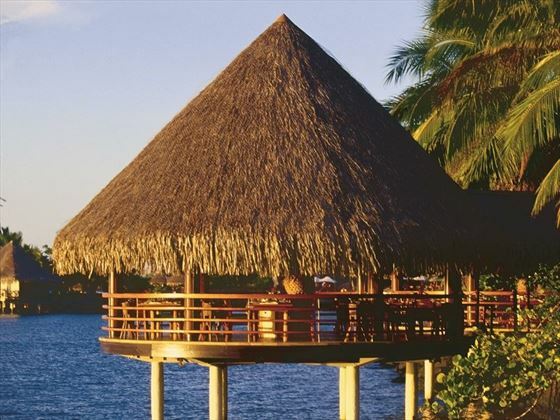 The rooms and suites here adopt a traditional Polynesian charm, with the suites in particular offering a more contemporary take on the South Pacific style. Ranging from bright and airy Standard Rooms to the very spacious and elegant Antarés Suites, you can choose to either reside amongst the tropical flora, or treat yourself to an oasis that juts out over the turquoise lagoon. 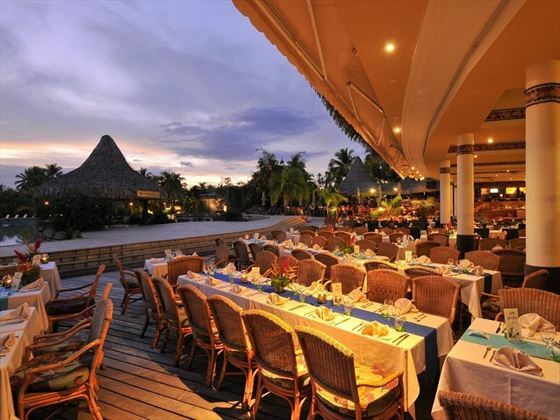 The restaurants and bars are steeped in culture too, with sumptuous seafood at Te Tiare Restaurant, creative dishes at overwater Le Lotus restaurant, and vibrant cocktails and brilliant live entertainment at Tiki Bar. 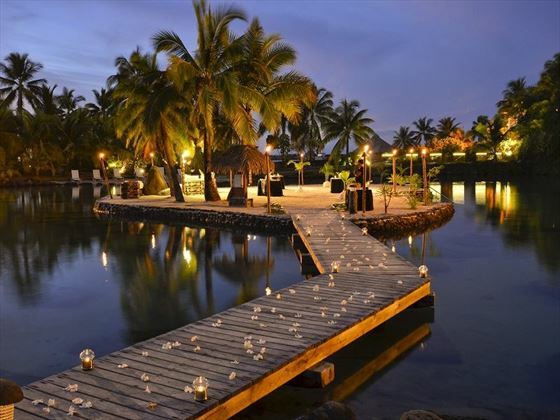 Located on the main island, this welcoming resort is a great choice for introducing you to the archipelago of Tahiti. 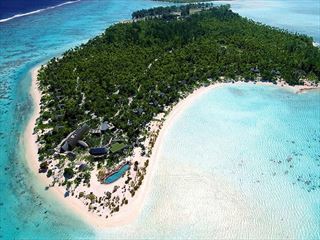 Overlooking the sister island of Moorea, you’ll be able to enjoy 25-hectares of luscious garden. 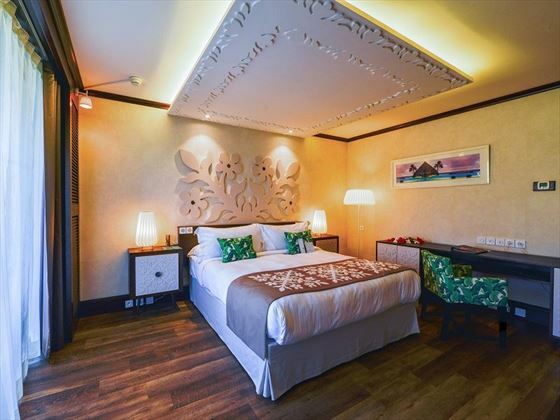 Standard Rooms – Lovely 28.5sqm rooms, decorated in the traditional Polynesian style and featuring a sliding glass door to let in the golden natural light. Superior Rooms – Gorgeous newly renovated 28.5sqm rooms, with more modern décor and a private balcony seating two. 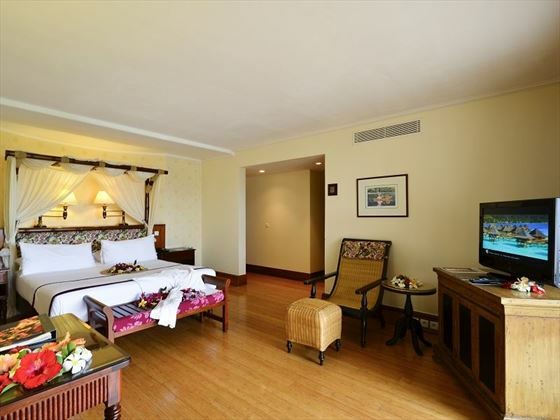 Panoramic Rooms – Spacious 38.5sqm rooms overlooking either the lush gardens or the lagoon from their private balcony. 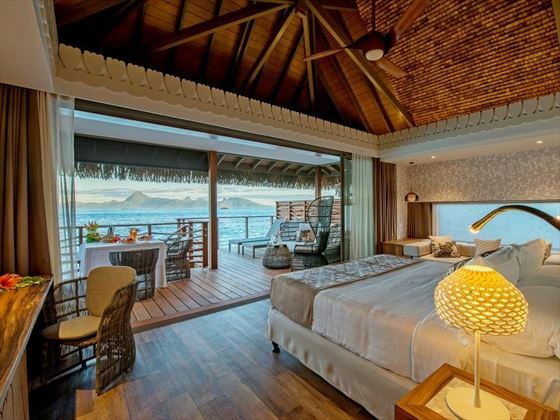 Junior Suite Overwater Lagoon Bungalows – These beautiful bungalows are located near the Lotus infinity pool, boasting 38.5sqm of space, a 12sqm deck, a separate lounge and space for two adults and two children. 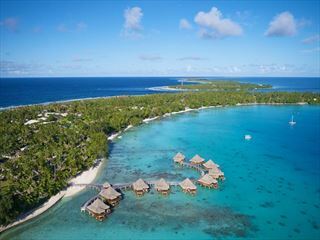 Junior Suite Overwater Superior Lagoon Bungalows – Offering a modern take on Polynesian style, with 37sqm of space, a 16.5sqm outdoor deck adorned with a table, chairs and two deckchairs, and glorious views of the sister island Moorea. Sleeps two adults and one child. 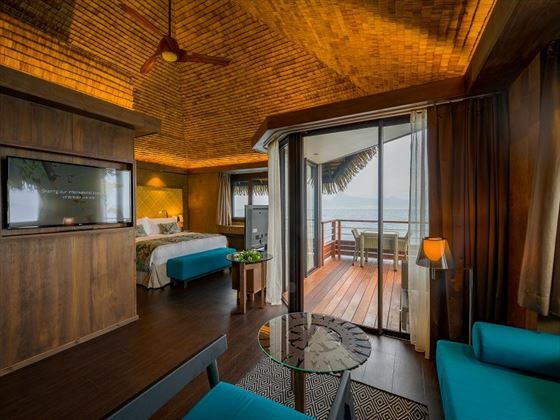 Junior Suite Overwater Motu Bungalows – These eight luxurious bungalows are built around their own private motu (islet), boasting 37sqm of space, a big 32sqm outdoor deck directly over the lagoon, and space for two adults and one child. 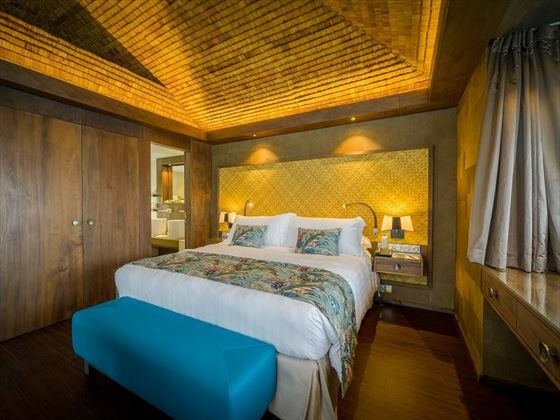 Overwater Motu Villa Suite – Elegant overwater suites, with 95sqm of space including a 30sqm outdoor deck, an intimate ambience, and large glass doors that brings the outside in. Sleeps four adults, or two adults and two children. Antarés Suite – This is the biggest and most luxurious suite, featuring 115sqm of space, a separate lounge, a private bar, and a stunning view of the hotel grounds and Moorea. Designed for two adults, though can accommodate one child. 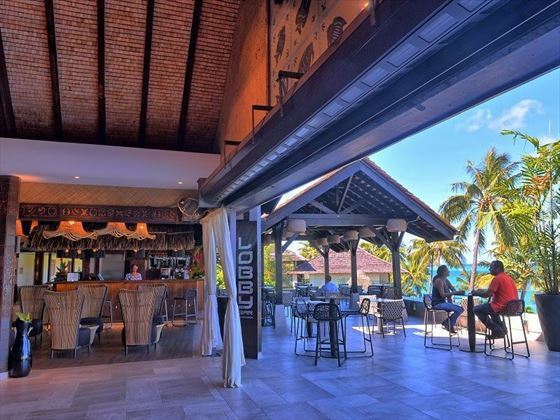 Te Tiare Restaurant – Offering a taste of traditional Tahitian cuisine, with an open kitchen and picturesque views of the infinity pool and waterfalls. Open 6am-9.30am, serving breakfast, light lunches and divine dinners. Enjoy a dinner show on Wednesday and Friday nights. Le Lotus Restaurant – A sophisticated overwater restaurant located next to the sand-bottomed swimming pool, bringing to the table light lunches and innovative dinners amidst a romantic setting. Open 12pm-2pm and 6.30pm-9.30pm. Lotus Swim-Up Bar – Open 10am-6pm, swim-up to this friendly bar and order up one of the popular zesty cocktails or tropical smoothies. 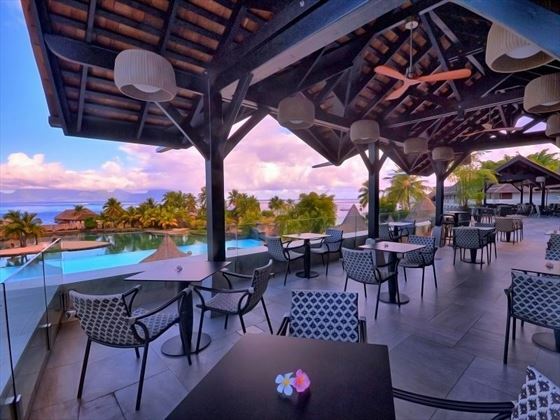 Lobby Bar Terrace – A trendy lounge bar ideal for an after-dinner cocktail and striking views of the lagoon and Moorea. Open 24 hours a day. 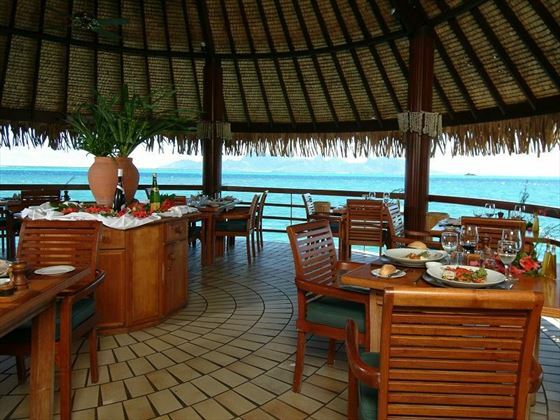 Tiki Bar – The resort’s main bar, which has become very popular with not only the guests, but the locals too. Sip an exotic fruit cocktail whilst enjoying live entertainment every Wednesday to Saturday. Open 10am-10pm, with Happy Hour 4.30pm-5.30pm.